,,,Almost 0:00,arrived to a metro station in Kiev.Thanks to Vitaly for help in metro.Sorry for visiting midnight to my first host in Ukraine. Let's explore Kiev city,,No!memory stick of my brain have been overheating by Vilnius and Belarusian trip,I don't want to get new information,,and firstly I need to find CS-hosts,,after all, all day with computer. OK,let's go outside,,NO!my stomach hasn't finished to digesting all of incident in Vilnius and Belarus,and I should write references for Belarusian CSers,,after all,haven't gone out whole 2 days. I was damaged by sun,all day I was sleeping in the bench of park.I don't have energy for CSing anymore,,but I surfed to new host,anyway. Honestly,Minsk was not interesting city though,I miss Minsk because of nice Belarusin people.Today also I repeated walking and sleeping on bench because it's so hot! Met with Vrenja whom I gave up to meet in Belarus,but she didn't give up it and contact with me when she traveled to Kiev,I'm glad it even if she's not Belarusian. Tonight's hosts also attacked me by continuous general questions,,I nearly get depressed but barely could keep smiling,I know they meant no harm,but there's still no answer how can I get used to for it?? .Kept sleeping in host's home. Evening is nicer to walk,,Oh!it's like hot Arabic countries?! .Met with Vitaly again in musical studio.Soon after I met with his bandmate Ivan,he took guitar and asked me significant question of life by improvised song,I like such person!,,but then,he talked through about God,,but I remembered that such incident was very usual when I was in Islamic countries,and never happened in Japanese life,,"sometimes" is better for me? .It's still difficult to let CSers understand me.Most of their repling CS-mails are similar,BUT, "Just call me" is equal meaning to "we wouldn't be able to meet"
.Ivan is working musical studio.Most of today I practiced guitar at there. (16,Wed),,,I don't want to write CS-references anymore.It's difficult job. .Into the wild with CS-host,,,even if it's park just outside of Kiev,camping in nature was rare in my travel(even if I had slept outside many times without tent or sleepingbag),,,maybe first time?? (17,Thu),,,I can't reply many e-mails,anyway. .Capmping was great,but I'm not used to,so I'm tired much. (20,Sun),,I'm Sorry to some CSers for changing my plan,because CS-host Mirka's place is so comfortable,as result I stayed for 3 days. .Interviewed with BBC correspondent,she's also CSer. CS-hosts recommended me ,so I walked and peeped village of Kiev. Since Sunday,I'm traveling let bank o Kiev,area o same metro station. .By the way,I'm not writing bad things in my Kiev' days. Finally I came back to right bank of Kiev by foot. I'm still continuing to meet with many CSers. Today I made a new record that I and a CSer had met but there was silent time for over 30 minutes. Time runs like speed of light,I've been in Kiev alreday for 3 weeks! By hectic CSing,finally I depressed,but I went to meeting point,,,over an hour I waited though,a CSer didn't appear.It's time to quit CSing!? .Since I came to Kiev,I enjoyed sleeping the night only a half,because half of night have been spent for Internet of CSing,although every hosts offers me nice and clean couch,Sorry! .But Finally in this morning I could finish all of (my duty')writing references to CSers,I was always delaying it for 20 CSers,,it's really bad for healthy mind. .Slept at bus stop's bench for 3 hours.Then walked,and slept( and repeated them for 5 hours),,when I noticed I was already inside "Pirogiv open-air museum".Actually it's nice place,so I enjoyed sleeping on the grass field,,Since when I came to Kiev,most of daytime I'm spending on the bench?! .Sorry again for Internet all day long. Left host 23:00,visit next host 0:00. Sorry again for Internet all night long. .In the morning,I got mail from tonight's host"Sorry I'll fly Today"? !,,but the present host asked her CS-frined about me,Thanks! .A girl let me in her family's flat and use Internet! She didn't know CSing(yes I'm a kind of CS-ambassador,to driver of hitchhike or,,anybody),but she suggested me to go together to festival,nice! .As result,host was good to share time with,,I can't describe but when next morning,even he became one of my memorable CSers. Of course it's not only by opponent,When I'm positive,it will work out more better,,but just difficult to keep good state of me.How many people complained me so far,like "Why do you surf only for 1 day? it's too short." Yes,it's short,but Life is also short,anyway CSing is interesting so that I can't slow down it,and the number of people whom I can meet in this life is too limited.Even if I continued travel for all my life,it would be just a only little bit of the World.What should I do?? .At coast of Kiev Sea,a girl was practicing of sing and dance (for preparing when she became a star ? )with splashing ripple. I wanted to walk till lighthouse but guards stopped me(not good),but they seemed to ignore a girl(not bad). .Back to Kiev by hitchhike. Every 3 minutes some driver stopped :) BUT,everybody asked me money,,It's totally same as Kazakhstan or Kyrgyz (Soviet culture)!? ,,,Can I travel Ukraine by hitchhike?? .Anton invited me to record my songs BUT,it turned into recording of his friend Marcas' improvised song "Ushi is not Sushi" until midnight!? .Suddenly I found 10,000 dollars on the street! BUT,next moment someone grabbed it from me and disappeared!? Easy come,easy go! .a CSer invited me not Sushi but more popular food in Japan,"raamen"!,,,I couldn't stop tears' falling down.
" How many cancel-mails must I receive from CS-hosts,before I sleep outside? " ,,I didn't want to sing such song,of course! but That's the CSing. Finally I started to prepare for getting out Kiev. from 0:30am till 19:30,almost non-stop for Internet. ,,Finally I might leave from CSing?? BUT,I already got invite answer mail from over 15 CS-hosts in Kharkiv!? .Because you asked me so that I narrated my story how I got close to religion,but then,why could you say "nowadays religion is dying,it's better because it's bad thing. ",,,Excuse me,Were you listening me?? .It's already 25th hosts in Kiev. .Finally I visited Chernobyl museum,,,but No English,unfortunately I didn't understand it. .Finally I ate Sushi in center of Kiev! Delicious more than I expected! but it's another matter that "Don't think it's same as Japanese." .Finally 2 of my future hosts wrote me "You can use my Internet through the night",,I feel guilty for it. I was waiting until Today's host will finish Internet and lend me it,,but it's already morning 5 am (now). .Finally the number of CS-members reached to 2 million! ,,,but How many e-mails will I send to them more!?!? .Finally,suddenly but unexpectedly my recorded songs'CD has completed,Thanks Ivan. .In heavy rain,2 girls were dancing lightly with joy for rain. .Finally I will leave Kiev!! .At the edge of Kiev,entrance of highway.Traffic police,hitchhiker and prostitute were standing,every of them want to stop car in a different purpose. .A driver told me "Without money till Kharkiv? you're crazy" But he's also crazy to ask me 200 euro. ,,9:00,standing again same point as yesterday. ,,Somehow reached to half to Kharkiv but it's already 15:30,even if nice summer sky,it changes to dark rainy clouds soon,the problem is not only Stopped drivers ask me money but,any cars rarely stop!? .An example: Ushi"denge ninaada? ",Driver"pachimuu ninaada? naada,naada",Ushi",,,Pachimuu naada?!" .Many drivers don't understand hitchhike,it's OK.But a driver fooled on me "No money!? So you will walk till Kharkiv like a idiot!?" .At the edge of small city,more 130km to Kharkiv,but it's already after sunset. By my Yellow color reflex jaket(for dark winter) every car nearly stops because they mistakes I'm a police but soon everybody notices and runs away(hundreds of cars in a few hours),,finally I gave up for TODAY,Sorry for host! Be exhausted,slept on the concrete,,but heavy rain came,,Somehow on the bench under the roof. ,,Slept outside(on the bench) twice in a week.My last journey(10 years ago)was always like this,but I'm not young anymore,, Exhausted but arrived to Kharkiv at 10:30am.After all,The word of Kiev's last host was true,,No!it took even more than 24 hours!? ,,So I stayed on the bench of central square for 5 hours,,,!? Since I came to Ukraine,I'm living on the bench both night and day!? CS-host of two were extremely nice!this is Heaven and Hell. but after 12:00 am,they satered to make pizza!?!? With extremely pretty host,rode a train to small town Merefa. but after 1 am,shasirik with family!?!? .After I sat on bench in front of apartment,soon 3 hours passed. .Host was from Iraq, his story made me despair for travel there(I was planning to go there).I have been cheated by media. .After I sat on bench by church,soon 4 hours passed. .Host is going to Istanbul,,mee too!? but I'm not sure when? .Visited CSers who is going to Saudi Arabia,,,?? everyday I have been invited from the area where I will go later by God of Travel!? I was planning to reach there within 2010,but I may travel in Europe more a year,,?? Anyway,according to the order,tomorrow I would meet someone related Africa,maybe? ,,,I didn't meet someone African today. Today's host was busy but left me her friend,Andrey.He showed me his favorite nice view'place of Kharkiv,but more,he showed anything from his heart,already he's one of memorable person whom I met in my journey,we talked even about someone close person's suicide,he even told me "I'm not a gay but I want to try to live with you in same flat"!? Then,we reached to host's place but I even couldn't say goodbye to Andrew. Since I came to Europe almost nothing bad incident happened so far,I became to be weak like a child unawares.The thing is that even if it was only a moment,conceiving murderous intent was too much,I was damaged by myself. It's the first time that I decided to write negative reference on CS. Even I joined party of host and friends,I was worst nervous state.It's not only last night.Today's host also took me to friend's place but I was like a stone.And I can't answer to"Do you like Ukraine?"anymore. Preparation for my CSing in midnight as usual,,After all,only 1 invite came from CS-host of Donetsk,so I changed the plan,in haste from morning I started to send mails to many CSers of Donepropetrovsk,,,Even after host went out,continued its work,until host's family let me out.Then,visited neighbour CSer's home,then I continued its work until go to tonight's host,,,I'm almost not CouchSurfer but InternetSurfeк!? .My travel firend (CSer, t0ma5)was planning to go to Japan,so I sent mail and found some of my friend in Japan who can host him,,but today I noticed he already had given up to go Japan. .There were blank days but today also I met CSer who had realtion with Arab. .Everyday I'm sleeping much in daytime because I'm online for CSing in midnight. .Hitchhike to suburb city.Drunken truck driver entertain me by car-chase by himself,reminded me of "Rupin the third"(Hayao Miyazaki' first movie). .Suddenly no contact from one of Kharkiv' host,and no connection with tomorrow's small town'host. I tried to write but Who is reading this blog!? so I don't. Anyway it was too tough to remember all of memories between 3rd July and 23rd'morning,many of hosts were so nice,but I reached my conclusion about in which place and when I separate from my wallet?BUT,How can I ask it to them!? Lost cash never come back again. Anyway I have 2 choices,Quit CSing or Change my mind to CSing. OK,from the first I was negative ambassodor of Japan,I can become negative CSer too!? Too hot to hitchhike,besides it's stil non-mobile-connection but somehow when I arrived to Bohoduhiv 3:30pm finally connection with her mobile "I will go back a few hours later",,,actualy I waited(with slept)for 5 hours in bus atation,but Sasha was one of memorable hosts and invited me Japanese instant noodle"raamen",it made me move and cry(sushi is not No.1 food in Japanas I'm always telling),Arigatou(Thanks)! Thanks Sasha(English teacher) and her sudent's family for inviting me their trip to non-famous sightseeing spot!,,How many times I joined somebody's excurtion like this,so far?? They seemed to think hitchike is not good,but it's OK.
,,,It's OK most of driver asked me money,it's here's culture,I'm a hitchhiker,just don't ride their car,BUT,surely Ukrainian are different from oter countries'people,why they need to laugh at me or shout me"!? Go by foot!!"
. "How much? ","no money","OK,sit down!" Grosha has high ability of talking although we hadn't common language,I like tis kind of people! .Anyway I could contact and meet new host,I was glad even if bed was iichin by fea,,?? Aftar all, surfed to one of comfortable host again.Almost non-stop for Internet,couldn't decide how order I should travel?? I got many invite from Donepropetrovsk or Donetsk or else,but Ukraine is biger than I imagine(and roads were terrible,cars can't run fast),and hitchhike is difficult more than I imagined!?!? Unfortunately,I had worst memories in Kharkiv though,I can say all of CS-hosts there were especially nice,so that strangely this town became one of my unforgettable place! .Thanks,student Alexey for lend me mobile and chat and exchange e-mail address with me. .In my last metro of Kharkiv,,,2 POLICES TOOK ME TO SMALL ROOM and check my luggage,they said they're afraid of terrorists,,I asked "Who can be terrorist?" they answered "Asian", OK,I'm an Asian. .Walked for 1 hour,edge of Kharkiv,couple hitchhiker from Lviv were waiting car for 3 hours under strong sun. It already 2:30pm,I'm always late to start to hitch. Even if the driver got lost inside city,Thanks for kindness!? but I wanted him to be more kind(why he couldn't drive until my host's place?) It was more than big distance to walk,no people in midnight town except drunken people,I don't need to have scared memory anymore! .She let me remember (my most favorite Europe)Romania,and will live in Poland and welcomed me there too,,,my eastern Europe trip might last more 1 year,,?? .In center of city,there's Japanese goods'shop,and a Japanese man is working,his opinion to Ukraine was similar as me(I won't write about it as Ukrainian people can read this :) He has been living in here for 3 years,but without Russian language? !How is it possible!?!? "There are many congenial friends,just we don't notice it now,but --- We may notice by only passing each other on the street." ,,,So that my hitchhike started late again. .at 7 pm,stood at entrance of main road to Gorlovka(50 km from Donetsk so I was optismic),other people catches car one by one because they pay to driver as usual here. After sunset,when I gave up around 9 pm,a family picked me up(as usual :).They could take me only for several km,but the mother(driver)told me"At checking point Police may help you by asking drivers to drive you! ",,,I didn't think so but The dice has casted already! She asked to Police and gone,but they didn't care me 100%. I left them and continued hitch in the darkness,already made up my mind to sleep in the grass tonight,but a guy stopped and drove me to Gas station,"They may help you by asking customer'drivers to drive you! ",,,I didn't think so,,,yes nobody accepted it, at 11:30 pm finally I gave up again and phoned host(,,but No connection).Then,Vladimir appeared and drove me although it's far from his city,he seemed main actor? really cool! I nearly asked him to host me! ?,,,but somehow reached to Gorlovka!Thanks but Sorry for hosts,it was 0:30 AM. I couldn't have much time with hosts last night so that I stayed there one more night. .Continued to sleep until afternoon. .There are only 6 of "minuture-book museum" in the World,,it was amazing! .Host changed the plan suddenly "can't drive you"!? so I started to hitchhike from 9pm :( ,,Thanks Azerbaijani driver even giving me his tel No.even if he was drunken.---In the darkness,Gollum(from the movie Lord of the Ring)appeared with excited laughter"DONETSK,daa daa daa!!" and hicthhiked together? !---Stuck in same Gas station again with him. Gollum's act was something strange,very quick move lke jumping on the air,he's good at catch cars but doesn't ride them,,I noticed he was just asking money to drivers!? then(maybe he satisfied and went home? )he caught opposite direction's car and disappeared,,,he might be real Gollum!? But I'm also a bit crazy? seems that can't satisfy unless hard situation'hitchhike anymore? Do I want to sleep on wet grass after strong rain?? ,,but a kind driver sent me until host's flat's building,Thanks! Sorry for visiting after 0 AM. .Vadim sleeps at midnight.I do my CSing'Internet-job after host sleeps through the night.Vadim wakes up morning and let me join his home drawing lesson with teacher then take me to some places and so on,,,When shall I sleep?? .And he invited me to Sushi,(same as Kiev,I haven't expected but)rather delicious! Vadim was not CSer,so How I got to know him?---Katia invite me though her profile had no information,anyway I couldn't surf in her invite day,instead,Vadim sent me invite mail from her CS-profile's mail? !,,Who are they at all?? But I always want to try such case.How many nice hosts I've been meeting from mystery-invite so far!?!? ,,,After all,Vadim was super CS-host although he's not CSer,besides he suggested me to stay there as long as I want,,Mmm,I still can't move fast to next city. But I can stay in Ukraine only 1 month more,I still haven't reached to Crimea!? .Let's go to his friend's house in village Granitne with Balalaika! ...By the way,there are another village Granitne in same region,,How can people appoint meeting without mistake place? .at 5 AM,Vadim wake me up and took me to wonderful peaceful fields for his taking photos,,it's nice. .Dangerously hot to standing on th road to hitch,so I should wake up early,,,I couldn't.Now it's after 9AM,already outside is like the middle of fire. .2:30PM,left host's home and walked until hicth-point,,not good point so walked to more further place,repeating it for long hours in the burning air,nearly dying,but railway of trum doesn't finish till far area,,finaly I noticed it connects town and suburb's big factory area! I should have ridden it from the first.in the sunset,I caught a truck driver not for ride but for water. I had a meeting in Donetsk at 8PM,but I caught a car in Mariupol at 8PM,Sorry! .Woke up by dream that someone attacked me and full of blood scatters,,I think this is from my stress for writing CS reference everyday. .Host welcomed me by evening big dinner,,then this morning also big breakfast(omlet 3 people's size only for me)at 10AM,then big lunch(a few people's size only for me)at 2PM,I was used to be hungry,so that rather I got sick? !,,,but why host doesn't eat? I asked,,,she was fasting today!Oh,No!? .After all,I indulged host's kindness,,too hot and tough hitchhike yesterday,then all day inside home today,,it's extreme. .Now I'm contacting with many CSers of Dnepropetrovsk but I'm lazy and feel wasting my time to write such long name Dnepropetrovsk in each time.Although people has short name to call, Why there's no short name of Dnepropetrovsk!?!? .Back to Vadim's flat again. 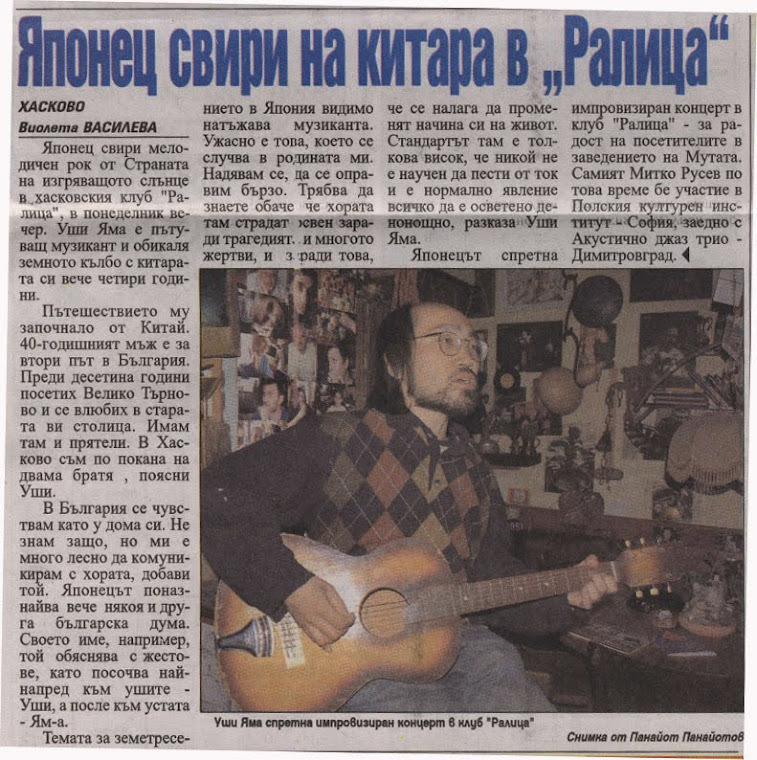 .Interview with newspaper of Donetsk.Although there were some interesting questions, synthetically I still feel incompatibile about what people want to ask or how people want me to be.People make my virtual image,but it's not me.I won't answer anymore to "Why did you decide to travel?" " Salon " part 1. 8:15 AM Today of 65 years ago,the atomic bomb was dropped by human in Hiroshima city for the first time in human history, over 140,000 people were killed. But I'm not sure how many Japanese people remembered about it this morning. .As every night I'm at different host's place,computer are also different. Since New Year,each time when I can write Japanese I neary start to translate my article of Lithuanian newspaper to Japanese but I still haven't done it.Anyway I need and want to reply mail to many CSers of several cities to organize my future Ukrainian trip ,but every night I just sleep because I worn out by heat.So I got depress again,,,of course sleeping is better than sitting computer through the night and yes I can quit CSing suddenly if I want. .Whether good thing happens or negative feeling occurs,anyway I forget about their impressions as long as I move everyday,it's quite good but rather bad.No matter what happens,just it goes on. .Lately some people whom I met in travel send me a kind of advertising mail frequently,,I didn't call them SPAM mail,but,,,!? .Lately a Japanese friend whom I met in travel pubished his travel book contained about me,,the day my book will be published come or not!? stand anymore,,,Staying same place more than 3 days is difficult to me? you,Let's drive to the river and go swimming now!" Wao!?!? sunset,reminds of me of Arabic countries'summer. still sleeping,so I slept again,,it brought me a small headache. nothing,,You hate people." Then,asked me shake hands!? .With depression,under the strong sun,walked from center for several km. river,watched fishes'swimming in aquarium),,but under strong sunshine,I was so tired. Suddenly Masha had to go to job,so I said goodbye. talking(like Masha),he and his friends were all drunken but quite nice night! tonight(as usual).Pity but I often can't concentrate to host by my other problems. .Goodby to african,,But what did I give to him?? new host,so I got back to Masha. Host was nice and talkative but I couldn't recover from exausted state,,,from the evening she and her friend took me to town,they talked me about their racistic opinion.But it was still almost normal,they had a friend who is neo-nati.It's first time for me that I talk with someone real racisit,I felt like I'm journalist. Once I decided to give up to go to Crimea,but I changed my mind again(even if one of Crimean CSer who answered me mail only by writing his mobile number!? and when I phoned him I didn't understand he can host me or doesn't want ro host,,),but late to start to hitchhike,,I decided to stop today at Melitopol'. Start to hitch at 11 AM,people's words that "Summer hitchhike to Crimea is easy,'cause everybody drives there." didn't make sense to me,under the strong sun,I just stood for long hours in the same spot with sometimes napping(by laying on the road),,gave up meeting in Sevastopl,even gave up reach to Simferopol because of sunset at Azov Sea,,,It was exactly same moment when I met with couple Russian travellers and hitchhed a car,the driver picked 3 of us,so I introduced myself to driver and at the same time to Irina (from Ural!) and Anton (from Siberia!) I wanted to ask the driver to host us but they didn't want to,,They hosted me in their tent at the river in Zhankoi,,Oh! I'm like a traveler!? .From Simferopol,Vova piceked me up,,,(Finally I met again with Black Sea since I left Trabson of Turkey in spring 2008)Oh! Crimea is beautuful as everybody says,,,at Alshta,he was heading to oppsite way from Yalta but drove me until we meet with my Yalta's host. .Seaside view from hosts' flat reminded me of Haifa in Israel. .FINALLY MARIA IN YALTA SENT ME MAIL BUT SHE CAN'T HOST OR MEET ME ANYMORE!? ,,,CSing work through the night,seems I don't have Crimean host anymore except Simferopol.So I must prepare next place's Csing. ..Host and friends showed me Yalta by walk and took me to ferry trip,we excited to it but as result we exhaused becuse it took more than 2 hours?! .Terrible Internet connection but I couldn't give up 'cause I have a lot to do,,but I couldn't do them. .CS-host in Saki (Crimea) wrote me again"We're in Moscow now,When will you come ? ",,but Moscow is not Crimea,I think. .Hitchhike and walking until good point to hitch,repeating. ,,then he took me to his job's fish food's factory,,oh I didn't need to feel I'm impolite. .Alredy after sunset but Roman's excurtion still had been continued. at Bakhchisaray's Islamic palace I heard Adzarn's starting,,(it's been a long time since I stopped to pray,moreover I'm eating although now it's ramadan month) Finally we arrived his city Simferopol and met my CS-host Artem at 10 PM,Sorry. .He just came back from his trip to Middle East 2 days ago but will go to Rainbow festibval in Moldova TOMORROW!? Suddenly my brain was ocuppied by Moldova. .But I sent over 100 CSing mail to Odessa for 8 hours non-stop through the night.
. a CSer sent me mail "OK,you can call me and come at that time. "from Tunisia! ?,,it was answer to my mail"Can I surf your couch in September? ",,logically he's right but my mail was sent in the year of 2008. Roman came to me at 10:30AM---introduced me to his brother the master of Japanese game "Go",actually it was my first time to play it,and a child taught me it---Roman learned Japanese from me only a phrase"Drink a beer",and registered CSing :) by the way,I and he don't have common language. .meeting with a CSer and surfing new CS-host,,but I wanted to try to surf to Roman's family. .At the edge of city,nice family drove me only a few km. "Are you pilgrim? ,,You can join us to our sightseeing in Yevpatrye today. ",,I wanted to join them but I don't have time in Ukraine, CS-host is waiting for me in Kherson. .from 12:00 to 5 PM,stood at same point(with napping on the road,and can see a mosque). a car drove me but for a bit,it's still not far from Simferopol,250km till Kherson,exhausted again. And so hugry,,finally I asked food to a woman in front of house,but I had no hesitation and she also seemed to be natural,gave me something to eat and "Good luck!" they took me to bus-terminal(? )and tried to buy bus ticket for me,I refused it and left there.Somehow I was back again on the street in nowhere in the midnight. ,,Unexpectedly today was the day I remembered how I was traveling before I became CSing addict. So far,Unrainian trip was quite rough and tough,but Thanks Ukraine for help becoming traveler again!? .What a lovely and cool girl Evgenya is! (but she's a good mama.) It was hard to leave them,but started hitch at 11 AM. .First driver was nice couple and told me another way is better to go to Kherson,although there's sign on the road "Kherson". So I chose it although some drivers stopped and told me Stand at another road! .As a result,I let my host wait me for 2 days. Sorry! but Thanks! for very nice and big welcome. ,,,I just want to know how other traveler are travelinng?? Besides Masha is waiting for me in Odessa (she suggested me to meet again in her 2-days trip),now it's already after 1 pm,I don't think I can arrive there until tonight,but she will leave theRe tomorrow,,,!?!? .It's late and it's rather cool day,,OK,this time I decided to use bus (for cacthing up with Masha)instead not to throw away meeting with Sweta THOUGH,she was also real traveler "You can hitchhike to Odessa from now! ", took me to hitchh-point. .Why I don't change standing point until get to dark? At bright gas station,I caught a car,,then dropped off at dark gas station. .Host is designer,flat is like kaleidoscope,besides her cooking potato was so delicious. .Unexpectedly Masha was super sociable CSer,gathered many CSers in Odessa to meeting. but I tried to visit my next(and only) Odessa's host. As their direction in e-mail,I visited hotel and asked to call BUT they said "We don't know such person,there's no apartment on this address except this hotel",I called to phone but wrong number? tried to find but none? Finally my continuous CSing stopped!? (I had no host here and hadn't prepared next city's host),,While I walked city to beach to meet Masha,I got exhausted and depressed much like becoming stone. AFTER SEVERAL HOURS WHEN I SENT CSing-MAIL TO TRANSNISTRIA IN MOLDOVA,I GOT A FEW INVITE MAILS FROM THEM,BESIDES 2nd SEPTEMBER WILL BE INDEPENDENCE CELEBRATION THERE,OK I WILL GO,,,BUT ODESSA'S BIRTHDAY IS ALSO SAME DATE. IN WHICH SHOULD I BE!?!? One of them seemed really want to meet me (me too,)but host was planning to "Ushi makes Sushi" this evening,so I suggested the CSer to join it :) BUT,host didn't want to invite others :( ,,,at the yesterday's restaurant's kitchen,I enjoyed to make it with talented cook THOUGH,host family themselves were not so willing to join it,,besides,as a result it was overwhelmingly different taste from real Japanese Sushi,,in the nice dinner by only Russian language with no paying attention me,I got depresed so naturally,,but host said to me "This is Japanese night,yes?" .As usual,I was late to start to hitch at 6 PM. Luckily Moldavian driver picked me up and crossed border!